ETH/USD market keeps slipping as the bears take over. Market supported at $118 by a potent mix of confluences. ETH/USD bears have been extremely active during Monday and Tuesday, taking the market’s value down from $126.50 to $119.50. The bulls will need to fight back but see very stiff resistance ahead. 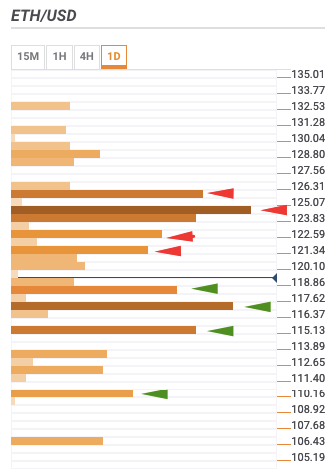 They can bounce back from strong support which lies at $118, according to the daily ETH/USD confluence detector. $122: 15-min Bollinger band middle curve, hourly previous high, 5-day simple moving average (SMA 5), SMA 100, hourly Bollinger band middle curve, SMA 10, and daily 23.6% Fibonacci retracement level. $123: 4-hour previous high and daily 38.2% Fibonacci retracement level. $124.50: Daily pivot point and upper curve of the daily Bollinger band, previous week high, daily 61.8% Fibonacci retracement level, and 4-hour upper curve of the Bollinger band. $126: 50-day simple moving average and monthly 38.2% monthly Fibonacci retracement level. $119: SMA 5, weekly 23.6 Fibonacci retracement level, and the hourly previous low. $117: Daily pivot point, SMA 200, and 23.6% monthly Fibonacci retracement level. $115.50: 38.2% weekly Fibonacci retracement level. $110.50: SMA 100, weekly 61.8% Fibonacci retracement level.